The Rosegal valentines day 2018 celebration is off to a great start. They have some great offers and they even have a super cute heart mouse cursor on the homepage, which is worth the visit to the site. I also love their Valentine's Day banner... anyway, enough about website graphics, let's talk about the clothing. ITEM 1: This is so much fun, I also feel like this is a realistic expectation for Valentine's Day, if you are living in a place where the weather isn't that great. It's cute, comfortable and cosy. You could complete the look by tucking it into a midi skirt, with some heeled boots. It would be great for a daytime coffee date. ITEM 2: This is another option if you are looking to go down the sweater route. This one is a bit more simple and casual. I love the subtle peach colour, which just screams Valentine's Day. Again, this would be great for a coffee date. You could pair it with some jeans and ballet flats. ITEM 3: This is a bag (well, of course this is a bag, Rosa). My point was, I thought it would be nice to add an accessory onto the list because they are often over looked but can make an outfit. I'm loving the Valentine's Day colours and shinny straps. It's also subtle, without being too much of a novelty. ITEM 4: I love the rose print design on this one. Red, white and pink is also one of my favourite colour combinations. This would work so well, if you are going to spend your Valentine's Day having an afternoon tea at a really posh cafe-restaurant-type establishment. ITEM 5: I am so so so in love with this dress. I want to marry this dress and have its babies (not literally because that would be impossible and super weird). The shape is so gorgeous, it's vintage but not the average vintage dress replica shape. It has a great clean cut structure and the colours plus pattern work so well. ITEM 6: These earrings are the perfect Valentine's Day accessory. They add an amazing touch of novelty to the day. You could wear them with a stylish dress and cute heart shaped handbag. I like the combination of red and gold together and even though they are a novelty product, they are still fairly simple and elegant. 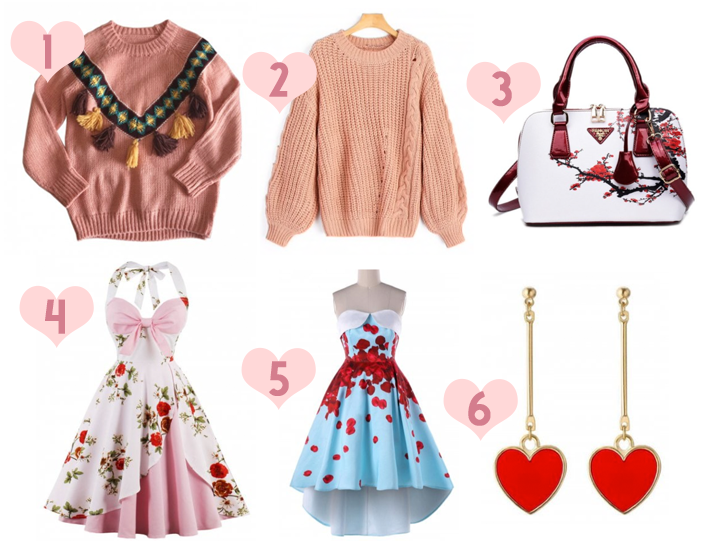 I would have to go for number 5, that beautiful blue and red vintage dress (you probably guessed because that's the item that I sounded most enthusiastic about). Whenever I think of romance and Valentine's Day, I think of glamorous black & white films and this dress fits the bill. What about you? Which one is your favourite? I would also really like to know if you have any plans for the special day. Thank-you so much for reading this post, I really appreciate it. Those sweaters are so pretty! I love dusty pink anything.